The romantic thriller Safe Haven, from director Lasse Hallström and adapted from best-selling author Nicholas Sparks’ (The Notebook, Dear John) novel of the same name, tells the story of Katie Feldman (Julianne Hough), who arrives in the tiny coastal town of Southport, North Carolina, looking to make a new start. Even though she’s hoping to keep a low profile, she finds herself interested in and attracted to local store owner Alex (Josh Duhamel), who has two young children. Each are haunted by their past, but hopeful for their newfound happiness and love. At the film’s press day, actor Josh Duhamel spoke to Collider for this exclusive interview about what drew him to the project, his desire to mess up the nice guy, the pressure of playing a Nicholas Sparks character, and getting to do so much improvisation in the film. He also talked about his roles in the upcoming features Scenic Route and You’re Not You, opposite Hilary Swank, and said that he’d love to do a ridiculous guy comedy, at some point. Check out what he had to say after the jump. Collider: How did you come to be a part of this? Was this a role that you pursued, or did they come to you? JOSH DUHAMEL: I don’t remember if they actually offered it to me the year before, but I had read it the year before. It was something that was interesting, but the character wasn’t dynamic enough. There wasn’t enough going on. And then, it came back a year later and it was much better. There was more to do. But then, I found out Lasse Hallström was directing it, and Marty Bowen is a great producer and a friend of mine, and Relativity does these movies really well. It was the whole package. The story was great. Then, it was just a matter of collaborating with those guys on messing the character up a bit. I wanted him to be a guy who wasn’t perfect, who made mistakes, who was just trying to figure it out as he went, with these kids, and who maybe hadn’t grieved the death of his wife in the right way and, as a result, his kids were struggling. There were a lot of things that you could do with the guy. He could have easily been a boring suburban dad. Sometimes characters like this are the hardest to play because you have nothing to hide behind, other than what’s really going on. Are there more challenges in playing the nice guy than the bad boy? DUHAMEL: When you’ve got a nice guy, I tend to want to mess him up. I don’t want him to be this sappy guy. By nature, it’s going to end up that way, anyway, so whatever opportunity you have to throw some roadblocks in front of him that make him make mistakes, and then learn from those mistakes, is good. Nobody wants to just see a guy who always does the right thing. To me, that would have been boring. It was a really fun movie to figure out. I really trusted Lasse to help me make this guy complex and interesting, and this relationship, not only with Julianne [Hough], but with the kids, interesting. In my opinion, he’s one of the best at finding simple human behavior that we can all relate to. Did a lot of those added moments make it into the final cut? DUHAMEL: Yeah, a lot of the stuff in the movie just made me feel so good that I was heard, creatively. There are so many things in the movie that I went to him and talked to him about. I would say, “What if we did this or that?,” or “I tweaked this scene. What do you think?” There were so many moments like that. The whole door thing is a silly little runner that doesn’t really mean anything, other than the fact that he has a door that doesn’t work. I’ve seen Lasse’s movies, and there’s always something like that that’s a little slice of life that doesn’t really have much to do with the story, but it’s everyday life that everybody goes through. So, I talked to him about finding something and we came up with this dumb idea about the door. It’s things like that, or adding a bag in the back of my car to give her scrapers and sandpaper and primer, that wasn’t in the script. There were little things that we could find humor in that weren’t too vanilla. Knowing how popular Nicholas Sparks’ books are, and how well the movie adaptations have done, is it a bit intimidating to be a part of one? Are you typically a sucker for romantic movies, or were you more drawn to the darker element of this story? DUHAMEL: I’m not usually a sucker for these kinds of movies, to be honest. But, I did really like The Notebook because what they had in that movie was real. I really felt those two. It was a good movie. It’s like music. It doesn’t matter what kind of music it is. If it’s good, it’s good. I think, if you have a guy at the helm like Lasse, who has really good taste, then it works. He said, “This movie is going to have sentiment, but we don’t want it to be overly sentimental. We don’t want to play the melodrama. This is just about real people. It’s almost a voyeuristic observation of two people falling for each other, and what little things happen to make that happen.” I think he did a really good job of that. He’s a very patient filmmaker, and I love that about him. So, do I like movies like this? I like any movie that’s told with integrity and good taste. What was it like to do so much improvisation on this and really get to find those moments? DUHAMEL: It’s scary, at first, until you realize how it works and how he works. For me, I’ve always been somebody who comes with a lot of different ideas, and a lot of people don’t listen. It’s frustrating because I do feel like I have a lot of good creative ideas. Not all of them are good, but at least I want to be heard. I’ve been fortunate enough to work with a few guys that have been really open to ideas and trusted my instincts on things. And Lasse, more than anybody, really trusted me. That’s really empowering, for an actor. Do you have any idea what you’re going to be working on next? DUHAMEL: I have a movie coming out that just got into South by Southwest, that’s called Scenic Route, which I love. It’s totally different. It’s dark. I have a mohawk in that movie. I start out as this guy who works at a bank, and end up with this crazy mohawk, at the end. That’s totally different than this, which I’m excited about. And then, I just finished a movie with Hilary Swank, called You’re Not You. That’s based on a book about a woman who develops ALS, and I’m her husband. She ends up kicking me out of the house, and I work my way back in. It’s a really dramatic movie. It’s heavy, but good. And then, I don’t know what I’m going to do next. What do you look for, when you’re looking at possible projects to get involved with? DUHAMEL: You never know until you read it. I don’t want to say that I want to do one thing or another because, if you have your mind focused on one thing, then you’re missing out on opportunities for other things. If it’s another love story, and it’s good with a good director, I’ll do it. But, I would also love to do something dark or funny. I would love to do a ridiculous guy comedy. That’s one thing that I’m really looking for. 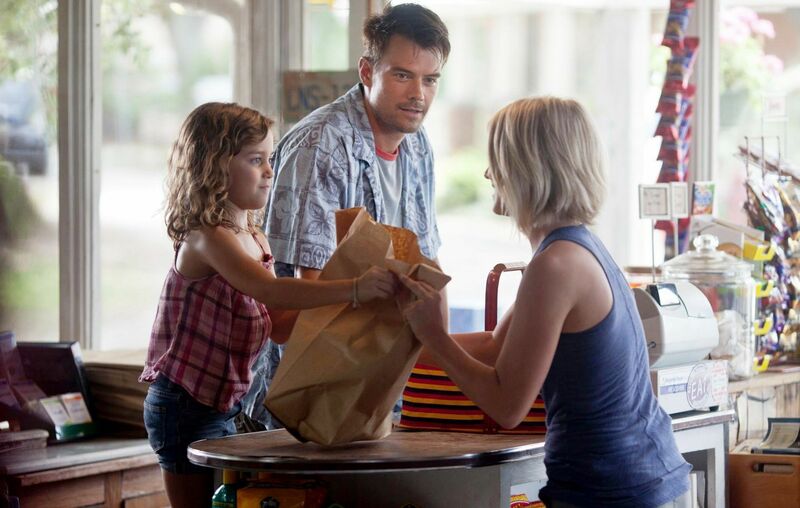 Safe Haven opens in theaters on February 14th.